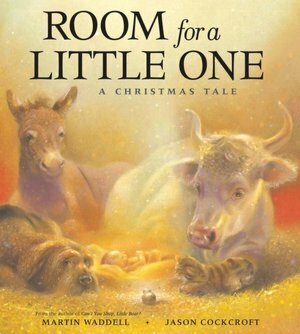 Today we read Martin Waddell's "Room for a little one", one of my favourite Christmas stories. The story and the illustrations are gentle, and my kids enjoy hearing the traditional story of the nativity told from the animals' viewpoint. 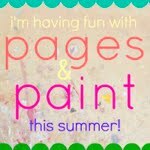 We are always repeating the title, "There's always room for a little one here!" as someone tries to squeeze in on the couch or find a spare knee! The Christmas star in the Advent calendar for today suggested we should set up our nativity. When my Grandad died about eight years ago, Mum gave me his old nativity set. We set it up for a few years but each year another piece would literally crumble in our hands. 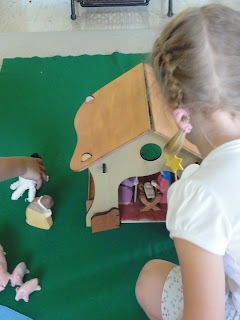 So a couple of years ago we bought a beautiful wooden set from Honeybee Toys. We use the kids' farmhouse as the stable, and today they pulled out the fairy/farm playmat I made for them a couple of years ago. (Not really sure how many fairy flower rings there were in Bethlehem!) Tom found our farmhouse animals and aded them to the stable too, even the wonky sheep. 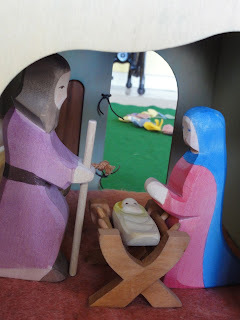 When we chose our wooden nativity set, I wanted one that the kids could play with, one that wasn't precious or just for looking at on a high shelf. Annalise made up her own nativity story - Mary, Joseph and Jesus were lost by our windowsill - but, wait, wait for it - their guardian angel came flying, flying, flying all over the family room until she found them and showed them the way to the stable.